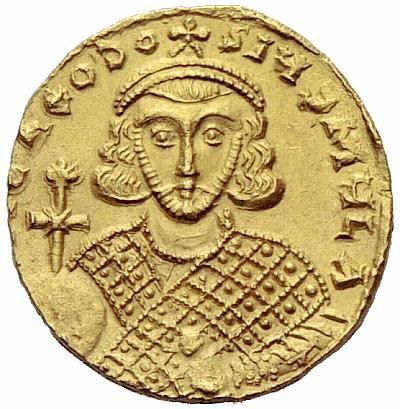 Theodosios III was Byzantine Emperor from 715 to 25 March 717. He was a financial officer and tax collector in the southern portion of the theme of Opsikion, before he was chosen as emperor by rebellious troops. He did not readily accept this choice and, according to the chronicler Theophanes the Confessor, even attempted to hide in the forests near Adramyttium. Eventually he was found and was acclaimed emperor in May 715. Little is known of Theodosius' short reign. He immediately faced an Arab invasion deep into Anatolia and the advance of the Arab fleet. In 716 he concluded a treaty with Tervel of Bulgaria favorable to the Bulgarians in an effort to secure support against the Arab invasion. In 717, the strategos of the Anatolic Theme, Leo the Isaurian rebelled against Theodosius' rule. Theodosius' son was captured by Leo in Nicomedia, and Theodosius chose to resign the throne on 25 March 717.